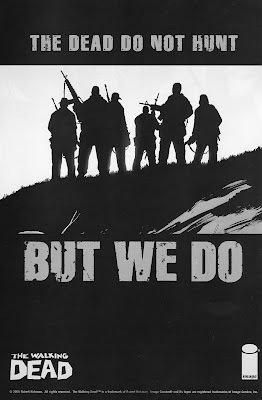 The survivors and the zombie herd - does it all kick off as the cover suggests? 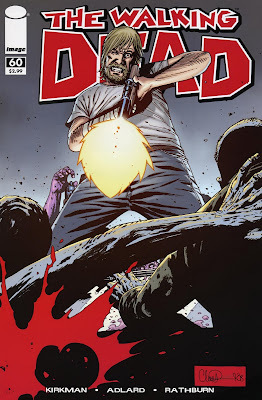 I was reading a review of last months Walking Dead (issue #59) where the reviewer spoke about the thrill of reading this title as a trade, with 6 (or more if you get a hardcover) issues giving you a longer and fuller reading experience, but how the monthlies could sometimes drag, as they had to be seen in the context of the arc as a whole. Not an easy thing to stomach when you have been waiting a whole month for the next Walking Dead fix, but I agree with the point made. This issue seems to be a bridging issue, another step closer to the new arc, which promises something on the scale of 'No-one is safe' from more than a year ago. 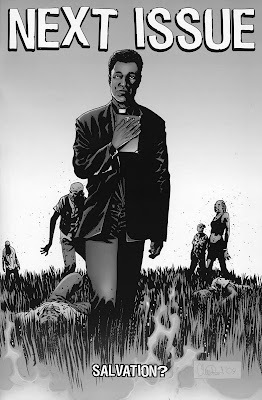 Also on the plus side is the emergence of a new type of Dale - an angry, bitter man, whose hatred for Rick seems to be growing for Rick, Dale also wants to breakaway from the group, settle down with Andrea and the children. Adlard portrays the mans anger and rage perfectly, the normally happy face darkened, twisted. Although for me the Maggie and Glenn interlude was not altogether successful, I understand why it is in there (there has been a few issues passed since Maggies suicide attempt, with no real follow up on it, or the aftermath). Dr Eugene and Rosita, Michonne and the kids all make a brief appearance. Eugenes explanation of zombie herd dynamics was welcome amidst the relationships drama. Some of the kids are playing with the remains of a dead cat. Whether they killed the cat or not is open to question, but is another killer detail that Kirkman casually drops in - are these kids turning into sadists? Is the environment they are in developing psychotic killers at any early age? The small scene raises a lot of questions. Some of these characters could be heading down a long dark road of the soul. As a result of this lack of excitement, it feels like the issue is a bit rushed. What is the point of introducing such a threat without really exploring it or utilising it more? This begs the question - is 'on time in 09' becoming too much of a burden for Kirkman? This is issue is a blip. It was a slight disappointment only because of the high standards we expect from the title. I just thought there could have been more action. The human drama was as good as ever, and in some cases (especially Dales anger and Morgans state of mind) these character explorations are really nailing it. 7.5 out of 10. I mean - how tooled up and fearsome do they look? Incredibly exciting times lie ahead (I hope) for this title.